We’ve all seen one before. The frayed, worn-out toothbrush with bristles stretching and poking out every which way. Our dental office in Eastanollee knows that sometimes we forget, and we use our toothbrushes until they reach the point of no return. But did you know that this can be bad for your oral, and even your overall health? It’s true! 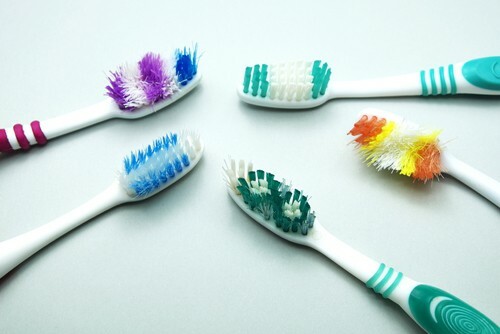 Worn down brushes and their battered bristles are a lot less effective at helping your teeth get clean. The American Dental Association (ADA) recommends replacing your toothbrush every three to four months — and our Eastanollee dental office couldn’t agree more! As a matter of fact, you don’t even have to wait that long. If the brush starts looked ragged and scary earlier than that, change it anyway. And keep an eye on your kid’s brushes too, as they need new ones even more frequently. Your dentist in Eastanollee knows how important it is to keep your smile healthy. The same goes for your toothbrush. Make sure you’re changing it regularly, especially if it’s starting to look like it’s seen better days. Don’t forget to store your new brush properly to keep both you and your smile free from bad bacteria and germs. We always want you to feel your very best! Accepting new patients from Eastanollee, Toccoa, and Habersham County.